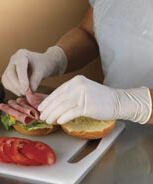 ThermalRoll.com manufactures a variety of Premium Disposable Gloves. Our products are all produced to meet and fulfill market requirements and are approved to meet FDA guidelines. You can order Disposable Gloves from us with total confidence that you are receiving top quality products at a Manufacturer Direct Price.